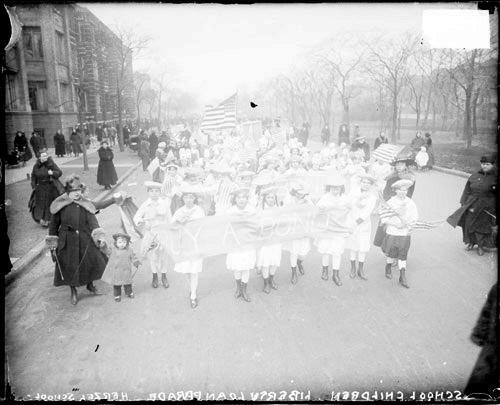 Title [Third Liberty Loan parade, children from Herzel School marching] [graphic]. Collection summary Informal portrait of school children from Herzel School at 1433 South Ridgeway in the North Lawndale community area marching in the third Liberty Bonds parade in Chicago, Illinois. Some girls carry American flags and one large one is visible in background. North Lawndale (Chicago, Ill.) 1910-1919.